viagra buy now This year’s trick-or-treaters have come and gone, and Halloween decorations are now stashed back in our garages. It’s November, traditionally a time to count our blessings. Here we are in America’s finest neighborhood, in America’s finest city. If you think about it, San Carlos is tucked into a true “Golden Triangle” of Mission Trails Regional Park, Cowles Mountain and Lake Murray. We’re living in “Heaven on Earth” and we have much for which to be grateful. So take advantage of the beauty and easygoing climate; take a stroll or a bike ride at Mission Trails or around Lake Murray; or treat yourself to the views from the top of Cowles Mountain. Enjoy the amazing amenities of our own backyard. 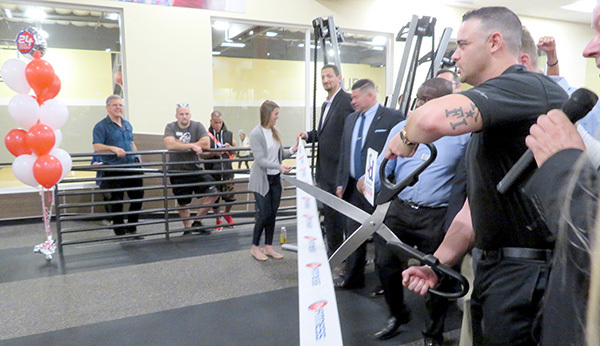 buy now On Nov. 1, San Carlos Area Council (SCAC) President Mark Schulze and I attended the VIP grand opening of the 24-Hour Fitness club that has moved into the old LA Fitness premises. Having been members of LA Fitness for many years, we were both impressed by how much elbow grease it must have taken to re-imagine and renovate the facility. The handball courts and child care room are both gone, replaced by a dedicated spin class room and aisles of workout machines. The pool and jacuzzi are ready to go. The men’s and women’s locker rooms are both spanking clean and they each feature several showers and a sauna. It’s 24-Hour Fitness’ 35th club in San Diego. General Manager Matt Ryan, who served as a Marine, and prior to that a college football star, greeted us warmly. He said that the club is happy to employ community members and help us get fit. click here We’ve got a new grocery story (Aldi) and a new gym (24-Hour Fitness). The Orchard Supply Hardware is closing with presumably another business to take its place. So when, oh when, will we ever see a new library? The one advancement toward this goal that we’ve seen in 20 years is a new sign with an architectural rendering of what the new library will look like. According to David Ege, our branch librarian, the adjoining parcel, formerly a gas station, underwent environmental testing months ago with a report issued in April. The city will not purchase that land to facilitate library expansion until the testing is complete and the county signs off. In August, the county had questions. It is now November and the Christmas wish on many a library-lover’s list is to finally break ground on the new library for which our community has patiently been waiting — for over 20 years. San Diego County, the ball is in your court. Consider becoming a SCAC member. The dues are modest ($7 per household and $15 for a business). Help support this local volunteer-run organization by sending a check to: SCAC P.O. Box 19246, San Diego, CA 92159-0246. If you wish to be added to the Interested Persons List or have a topic you would like to learn about, please contact San Carlos Area Council President Mark Schulze at mark@crystalpyramid.com. —Patricia Mooney is vice president of the San Carlos Area Council. Email patty@crystalpyramid.com.